From over the top to great action! Created for those who like the original but are getting more and more annoyed every time they watch it – by the silly moments, the dragging scenes and some way too over-the-top action sequences. My first idea was to create a truly believable version of Face/Off, to take out ALL scenes that bend reality too far. Soon I had to discover this was not possible, starting with the helicopter that prevents the jet from taking off and from there going through EVERY action scene. I was about to drop the project. But then I remembered how much a fan I actually was and am of the original movie and that most of these reality-stretching scenes were actually awesome for me, when I am in the right mood. Just some scenes did and do really bother me and prevent it from being what I would call a true masterpiece of its own kind. And there I had my next fanediting mission. Get rid of what was not fitting or just too much to take or believe. My main concern was to get rid of the stupid speedboat race, as this did always seem to be totally out of place. But again I had to realize: not possible. It is essential that the heroes get from point A to point B to continue the plot. What I did is to correct as many crazy scenes as possible, starting with the Hallelujah dance of Castor, continuing with Archer playing “chicken” with the jet to hundreds of bullets that hit no one. I tried to get rid of some of the superhero invulnerability of the heroes and make them more human and also tried to reduce moments that were meant to be emotional, but were actually more annoying, like “date night” with Archer (Castor) and his wife or Sasha telling Castor (Archer) about their son or the way too sweet family reunion finale. And this worked really well. The toughest decision was to cut the entire “mirror room” scene, where Archer and Castor shoot at each other through a mirror. It is in the original movie one of the most important scenes, yet it is so unbelievable in everything that it just gets in the way. I for one don’t miss it at all and to me it makes perfect sense that Castor (Archer) flees from a place that is surrounded with cops and special ops rather than taking the risk of a 5 minutes duel with his nemesis. 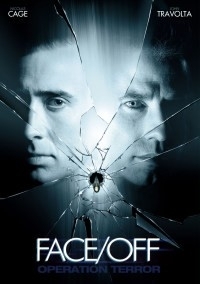 Face/Off was the best action movie in 1997 and it still is among the best, because of its fantastic effects and its cool thrilling plot of body (face) switching. It is also probably the best movie John Woo has made in the US. Unfortunately it was more of a metaphor for heroes and villains than a believable movie, which caused loads of scenes to be overacted or way too over the top. This fanedit aims to correct that and present the most watchable version of this movie ever available. Of course this movie still stretches the rules of reality far, but the worst moments are gone, presenting a breathtaking action ride and a great thrilling story in a new and more modern approach. With about 20 minutes gone the movie is condensed, yet still complete in both its mood and flow. - cut Archer(Castor) tying the shoelaces of dead Pollux. I love Face/Off. Awesome Woo action. Travolta at the height of his career in full-on Nic Cage mode. Nic Cage. What more do you want? A/V Quality - Bad by today's standards, still totally watchable. Visual Editing - Some cuts looked a little odd but was good. Audio Editing - Good amount of hard cuts in this one. Narrative - 20 less minutes doesn't harm the story, improves characters. Enjoyment - Still prefer the original, but this was really good too.